So how does eBay keep track of the millions of items up for sale at any given moment? Categories. The brilliant minds at eBay decided to group items into nice, neat little storage systems called categories. The home page lists most of the main categories, but eBay also lists tens of thousands of subcategories, ranging from Antiques to Weird Stuff. A category browse is an adventure that’s unique for each individual, and everyone deserves the opportunity to try it. Suffice it to say that if you like to hunt around for that perfect something, you’re in browsing heaven now. 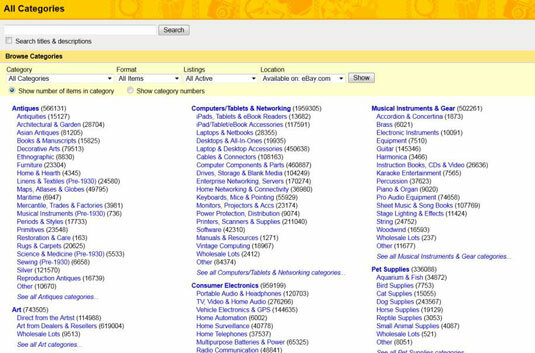 1From the drop-down menu on the home page next to the eBay logo, click the category that interests you, such as Entertainment. You’re transported to that category’s page. You see categories and subcategories listed next to each heading. Happy hunting. If you don’t find a category that interests you among those on the initial drop-down menu, simply click See All Categories at the bottom of the menu, and you’ll see the main categories. If you really and truly want to see a list of all categories and subcategories click the See Item Counts link at the bottom of the main category list. Or, you can also go straight to the Category list. 2After the category page appears, find a subcategory below the main category title that interests you. Click the subcategory, and keep digging through the sub-subcategories until you find what you want. For example, if you’re looking for items honoring your favorite television show, click the Entertainment Memorabilia category or the DVDs & Movies category. Note that the Entertainment Memorabilia category has many links, including the Television Memorabilia subcategory. Below the Television Memorabilia link, you’ll see links to these subcategories: Autographs-Original, Autographs-Reprints, Movie Memorabilia, Music Memorabilia, Television Memorabilia, Theater Memorabilia, Video Game Memorabilia, and Other. Click the link that appeals to you and you’re off on a shopping spree. 3When you find an item that interests you, click the item and the full listing page pops up on your screen. Congratulations — you’ve just navigated through several million items to find that one collectible item that caught your attention. You can instantly return to the home page by clicking its link at the top of the page (or return to the listings page by repeatedly clicking the Back button at the top of your browser). Near the bottom of every subcategory or search-results page, you can see a list of numbers. The numbers are page numbers, and you can use them to fast-forward through all the items in that subcategory. So, if you feel like browsing around page 8 without going through eight pages individually, just click number 8; you’re presented with the items on that page (their listings, actually). Happy browsing. If you’re a bargain hunter by habit, you may find some pretty weird stuff while browsing the categories and subcategories of items at eBay — some of it super-cheap and some of it just cheap. There’s even a Weird Stuff category (under Everything Else)! Remember that (as with any marketplace) you’re responsible for finding out as much as possible about an item before you buy — and definitely before you bid. So if you’re the type who sometimes can’t resist a good deal, ask yourself what you plan to do with the pile of stuff you can get for 15 cents — and ask yourself now, before it arrives on your doorstep.